Melissa Halas-Liang, MA, RD, CDE always had a passion for eating healthfully which is why she chose to become a Registered Dietitian Nutritionist and a nutrition educator. In 2006, she realized her true purpose…to save the world one healthy food at a time™. 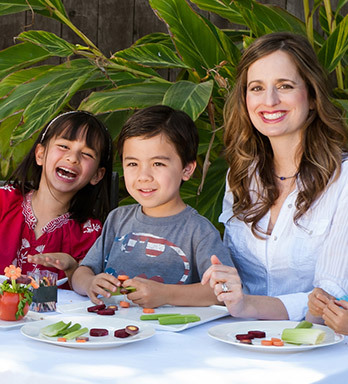 As a new mom, she was surprised to find limited expert resources on childhood nutrition, so she decided to develop SuperKids Nutrition Inc., a mega child resource for child and family nutrition that provides both easy-to-read, credible information for parents and healthcare professionals and engaging tools to educate children on the importance of eating healthy. Melissa believes that good nutrition is a powerful tool that can fuel you and provide sustainable energy so that you can live your best life. Her philosophy on nutrition is that regardless of your current food habits, small changes over time will eventually build momentum to create positive, powerful, and lasting results. Melissa shows kids good nutrition can be fun with her Super Crew children’s books and activities and through partnering with national and local organizations to drive healthier change! She enjoys presenting to educators across the nation, providing private nutrition counseling to families and inspiring parents and students to become more nutritionally fit through education. She believes good nutrition plays a vital role in spiritual, physical and mental health. As a Registered Dietitian Nutritionist and Certified Diabetes Educator, Melissa holds a Bachelors of Science in Clinical Dietetics and Masters degree in Nutrition Education and practiced as a Certified Nutrition Support Dietitian for ten years. Melissa has the Certificate of Training in Childhood and Adolescent Weight Management. She has over 20 years of diverse experience in clinical care, nutrition management, nutrition counseling, nutrition education, brand and product promotion, media and writing. She has served as past Co-President of the Los Angeles District of the California Academy of Nutrition and Dietetics (CAND) and currently serves as the California Academy of Nutrition and Dietetics Media representative. She provides a unique approach to health and wellness across the entire lifespan and combines both an evidenced-based and holistic approach to help her clients and audience reach their health goals. Melissa appreciates the expertise and vast knowledge that Registered Dietitian Nutritionists, and Nutrition Scientists bring to the community. As a former clinical nutrition manager, implementing the best practice guidelines for nutrition care has always been a top priority. That’s why Melissa is committed to working with the SuperKids Nutrition experts to ensure the highest degree of quality and accuracy for all the site content which is updated annually. She is also dedicated to using the best resources and experts to give the readers reliable and useful information that applies to everyday wellness choices. Melissa also provides nutrition counseling to families and adults emphasizing building healthy and realistic habits over time to create long-lasting health. For over ten years, Melissa has provided on-line nutrition and health education at universities and colleges to health professionals, fitness professionals, Registered Dietitian Nutritionist and the general public. She provides national, and community lectures on childhood and adult nutrition to a variety of organizations and enjoys motivating her audience by encouraging small steps to healthier lifestyle changes while creating a fun approach to living. Through SuperKids Nutrition Inc., Melissa shares her passion for creating a healthier “next generation” by working with other nutrition experts in the field to “save the world, one healthy food at a time™.” Melissa is the creator of the Super Crew®, a group of characters who get their powers from healthy foods. The Super Crew has given Melissa the opportunity to showcase her favorite pastime of creative writing with the publication of Super Baby Abigail’s Lunch Time Adventure (Sept 2008) and Havoc at the Hillside Market (Oct 2008). The books and her educational website activities entertain and motivate young children to develop healthy eating habits from an early age so they can achieve their full potential by living a healthy life. Melissa is continually working to spread her message on the importance of child nutrition education. SuperKids Nutrition provides nutrition content to over 5,000 schools in 40 states, partners with the American Institute of Cancer Research on our “Healthy Kids Today, Prevent Cancer Tomorrow” initiative, received funding from a CDC grant through Healthy Dining Finder to develop Super Crew toys and activity placemats for select restaurants in the Kids LiveWell program, and developed a free app called FoodLeap, with the National Restaurant Association. The app features Super Crew kid, Super Baby Abigail as she leaps and bounds across Rainbow Road and teaches children about the benefits of healthy eating. Melissa’s newest venture is her most exciting yet! She is currently developing a program that combines her two biggest passions—reading and health literacy—and will use the focus group tested and approved, Super Crew to help create future generations of kids who love to eat healthily, read, and learn. Visit Melissa’s personal nutrition and fitness blog which helps motivate individuals to live their best life through good health! Weight Management Dietetic Practice Group. Pediatric Subgroup. Nutrition Entrepreneurs Dietetic Practice Group. Authors Subgroup.